Heat grill. 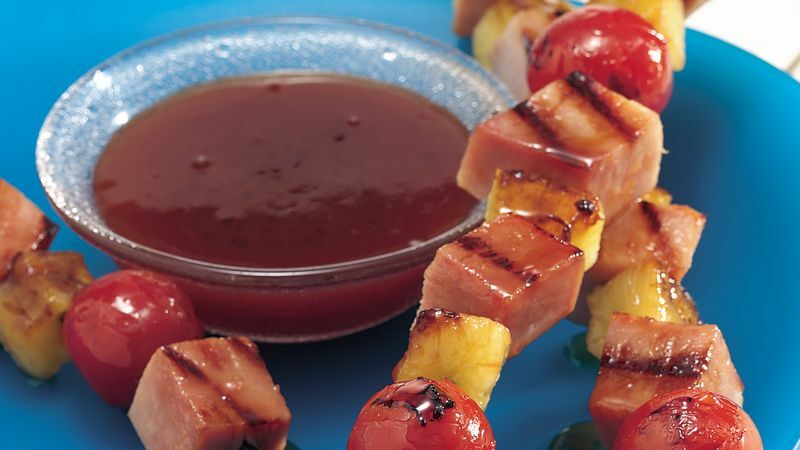 Alternately thread ham, pineapple and tomatoes onto four 10-inch metal skewers. In small microwave-safe bowl, combine jelly and mustard. Microwave on HIGH for 1 to 2 minutes or until jelly melts. Stir to combine. Brush 3 to 4 tablespoons jelly mixture over kabobs. When ready to grill, place kabobs on gas grill over medium heat or on charcoal grill 4 to 6 inches from medium coals. Cook 10 to 12 minutes or until thoroughly heated, turning once. Serve with remaining jelly mixture. Use fresh pineapple chunks instead of canned chunks. You need twelve 1-inch pieces. Ham from the deli or leftover from Sunday dinner can be used for these kabobs. At the deli, ask for 1-inch slices and cub them for kabobs. Try plum or apple jelly in place of red currants.